Haft-sin (Persian: هفت‌سین‎, also spelled as Haft-seen), is an arrangement of seven symbolic items whose names start with the letter seen in the Persian alphabet. It is traditionally displayed at Nowruz, the Iranian New Year's day, which is celebrated on the day of the vernal equinox, marking the beginning of spring on the Northern Hemisphere. The following are the primary items of Haft-sin, whose Persian names begin with the letter sin in the Persian alphabet. 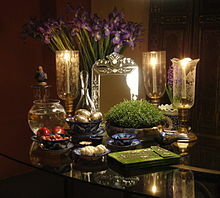 Other symbolic items that are typically used to accompany Haft-sin include a mirror, candles, painted eggs, a bowl of water, goldfish, coins, hyacinth, and traditional confectioneries. A "book of wisdom" is also commonly included, which might be the Quran, Ad’iyyih-i-Hadrat-i-Mahbú, the Bible, the Avesta, the Šāhnāme of Ferdowsi, or the divān of Hafez. Sabzeh (سبزه) is the symbol for the spirit of Ordibehesht (2nd month of Persian Calendar) who is the owner of vast clean oceans. Samanu (سمنو) - is the symbol for the spirit of Shahrivar (6th month of Persian Calendar) who is the symbol of grocery. Senjed (سنجد) - is the symbol for the spirit of Khordad (3rd month of Persian Calendar) who is the symbol of love and affection. Somāq (سماق) - is the symbol for the spirit of Bahman (11th month of Persian Calendar) who is the symbol of rain. Serkeh (سرکه) - is the symbol for the spirit of Mordad (the 5th month of Persian Calendar) who is the symbol of immortality. Seeb (سیب) - is the symbol for the woman spirit, the Sepandar Mazd, who is the symbol of rebirth and health (also see Sepandārmazgān). Seer (سیر) - is the symbol of the highest spirit of worship, the Ahura Mazda. Wheatgrass, one of the items of Haft-sin. An egg painting festival in Tehran. A bowl of samanu, one of the items of Haft-sin. Goldfish, one of the items of Haft-sin. A Haft-sin table at the White House. A Haft-sin table at a hotel in Tehran. A Haft-sin table at Sharif University of Technology. Passover Seder plate, a similar display for the Jewish holiday of Passover. ^ a b c Campo, Juan Eduardo (2009). "Navruz". Encyclopedia of Islam. Infobase Publishing. pp. 524–525. ^ a b "Noruz, manifestation of culture of peace, friendship among societies". Tehran Times. April 7, 2018. Wikimedia Commons has media related to Haft-Seen. Shahbazi, A. Shapur (March 1, 2012). "HAFT SIN". Encyclopaedia Iranica. XI. pp. 524–526. This page was last edited on 21 March 2019, at 16:28 (UTC).